The wind in your hair, and dozens of feet of open air beneath your feet ... 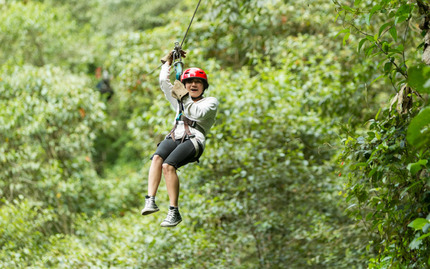 There's nothing quite so uplifting as a zipline ride through the sky! complete a breathtaking world that is sure to steal your breath ... Assuming you're brave enough to open your eyes! After you finish up with your trek through the sky, refreshments and a complimentary group photo await you back at the Just Live! basecamp, in addition to a 60' aerial swing! Talk about getting high on life! Note: The minimum age is 9 years old, and the weight limit is 70 - 250 lbs. No pregnancies or heart conditions. No neck, back, hip, knee, ankle or foot injuries or conditions. 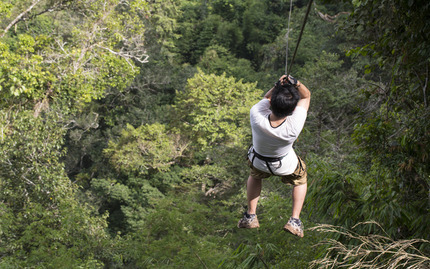 Guests must be in decent physical condition and possess some upper body strength. 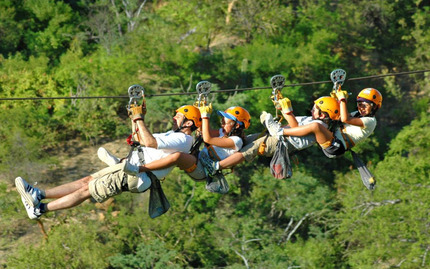 You must have the ability to run up ramps at the end of every zipline, cross canopy suspension bridges and ascend a 35 foot ladder climb. 100% refund for tours cancelled 48 hours prior to tour check-in time.